UNC wins, Wes back to the Colonna house. As many of you know, Derrick, Pj, and I have three season tickets to UNCG’s men’s basketball games, but we only got one Wes Miller Bobblehead. 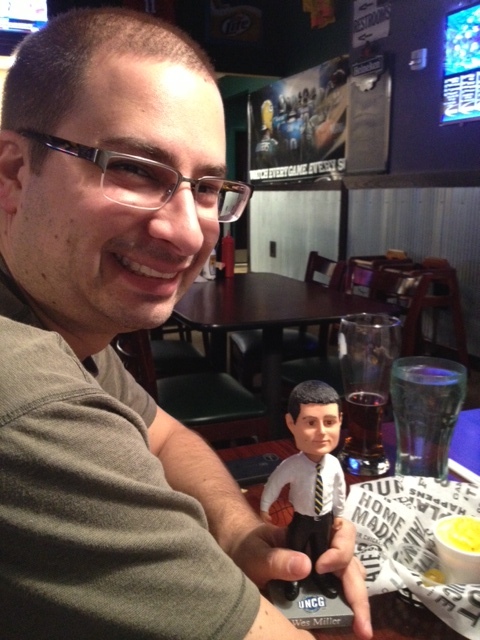 We decided that every time UNC and NCSU meet up the bobblehead would be on the line. Winner gets to keep Wes until the next game. Unfortunately, Wes had been hanging out at the Newkirk house because the Heels dropped the first game to the Pack, but we were ready to win him back on Saturday night! This was a decidedly different game than the first meeting. UNC was ready to play (all 40 minutes) and there were time where NCSU (led by Leslie) could not get it together. For the Heels, Bullock gave us his second double double of the season scoring 22 points and grabbing 13 rebounds. First year player Marcus Paige seems to really be settling into the point guard role- a tough one to be sure- as there were moments of greatness where he was leading the Heels on the court and a few pull up shooters that caused the crowd to go wild. The Heels were not stellar from the foul line this game. The did not make it to the line at all in the first half and in the second it was 11 for 16. Less than 70%, at the ACC level (really any college level) 70% should be baseline. Roy did pull his entire regular line up for a talk in the second half. I really like to see this when it happens and coaches pull hard on the reigns. The starters came back in and played to their full potential for the rest of the game. For the Red and Black, it is hard to fault the play of Richard Howell (was that a beard trim that he was sporting?). He had 13 points and 17 rebounds and the Pack lead the Heels in rebounding overall (43-34). Brown had a good game, but with only 6 points CJ Leslie felt out of synch and controlled by this UNC defense. It did not help that the pack went 6 of 13 from the foul line (46.2%). In other basketball happenings: Dennis Rodman is going to North Korea for some basketball diplomacy. Kim Jong Un is a big basketball fan and the 1990s Chicago Bulls was his favorite team growing up. Along with some Harlem Globetrotters, Rodman is going to see if human connections can be made on the court where they are not being made by the politicians. Is it crazy that I was most shocked that Rodman is 51! Of course he is, but it just seems like yesterday he was playing with rainbow hair and promoting his book wearing a wedding dress. And the reason that the game is really important often show up on high school basketball courts that double as auditoriums, not the big league sports complexes. In El Paso, a high school basketball manager got his moment to shine with the unlikeliest of help…an inbound from the other team! If this does not make you love the game, what will? This game was lost by UNC on the free throw line. Making only 13 of 23. Missing those 10 points and then loosing by 5. If I was free throw coach, the Heels and I would see the practice court awfully early tomorrow morning. Not acceptable and UNC can be better than that. Posted: February 13, 2013 | Author: secolonna | Filed under: ACC, Carolina, Dook | Comments Off on Go to hell Duke! This is, arguably, the best time in college ball. Both sides have squared off, the crazies are currently getting soaked in Krzyzewskiville (who wants to camp out for months when daddy pays for a perfectly nice dorm room?) and the anticipation of the game is at a fever pitch. Both games, plus the post season, are ahead of us and all that there is time for is good, old fashioned trash talk! The Carolina-Duke rivalry is the best in college basketball- it has it’s own Wikipedia page. This game is called the Battle of the Blues, or the Battle Along Tobacco Road. 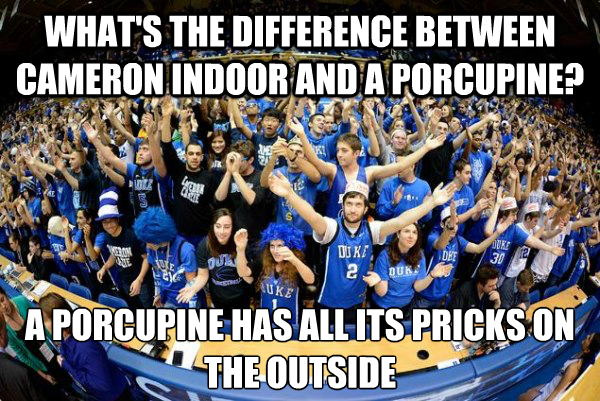 Only about 15 miles separates these two schools and that is what makes the love of the hatred even better! ESPN called the March 4, 2006 meeting of Carolina and Duke (at Duke) it’s the most watched college game in history. Then, there is the way that basketball is taught at the individual schools varies widely. Dean Smith (Saint Dean if you will) pioneered the practice of acknowledging the player that passed you the ball when you scored. Coach K (and players he has trained) are quite open that a great player should be a selfish player. Those different ways of thinking about and coaching basketball show up in the styles of the teams, the kinds of players they produce, and the skills that the coaches teach. Who’s ready for 9pm? Go Heels!